On a cold but very bright Monday 28th January, the Trustees were delighted to meet together at midday to install the new diocesan banner in St Cedd's Chapel, Chelmsford Cathedral. 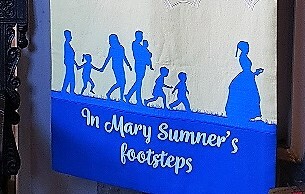 The new, MU banner which was designed and approved by the Trustees in 2017 is of a far more modern theme featuring not only Mary Sumner but a young family too. 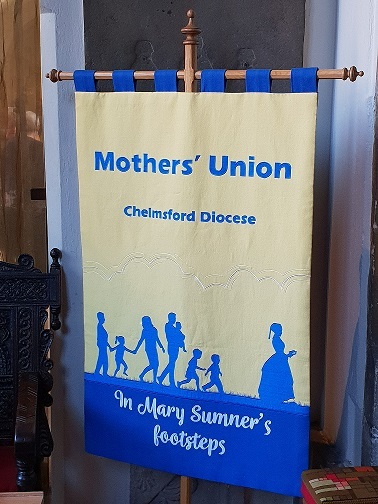 The wording on the banner is ‘In Mary Sumner’s footsteps.’ On the back of the banner you will find the Mothers’ Union badge and the Chelmsford Diocesan logo. 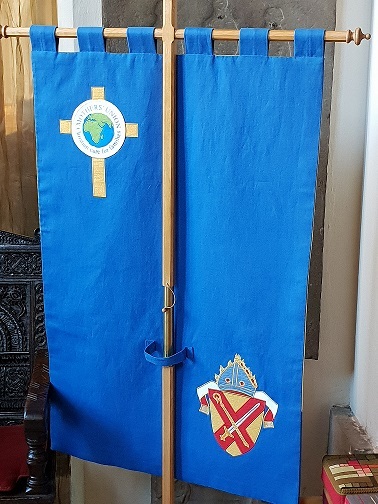 The new banner was made by Juliet Hemingray’s Church Textiles firm in Derby, as a result of the previous MU banner being destroyed in the cathedral by vandals who set light to it in June 2016. Update: Just thought you might be interested to hear that Mum shared the photos of our new banner from the Chelmsford Diocese MU blog onto the MU Facebook page - so far it’s had 143 ‘likes’ and 19comments (all positive) from around the world! One comment was from a member from Winchester diocese who was visiting Chelmsford Cathedral last week and saw it ‘live’, and one from our new WWP, who commented as I write this email! The wonders of the internet to reach others! Thanks Lucy Bubb.